You probably have seen these in many places. They are very easy and can be made quickly. I have the basics here, but always feel free to add your own little pizazz. I made two of them. For one I used popsicle sticks, for the other I used tongue depressors. 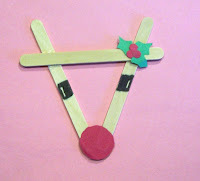 For the reindeer you will be putting the sticks into a triangle formation. Only one edge will not be on the end, it must be put in a bit, some stick will stick out--these are the ears. Add two eyes and a red nose and the basics are done. 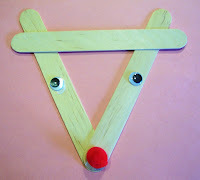 You can vary this by wrapping pipe cleaners around the stick by the ears for antlers, you can put on a string to hang it, or you can put magnet on the back to hang it on the fridge. You can even have the children color the sticks with a crayon. Let the imagination run wild!